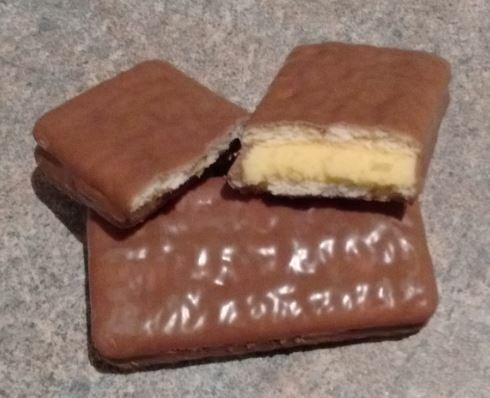 One of my correspondents recently pointed out to me that, in writing of the latest Tim Tam range, I had mistakenly missed out one of the new flavours. I tried it, and once again, it all just seemed so familiar. Déjà vu. Or Déjà mangé, perhaps. But why? What was it that I had eaten before that seemed such a perfect facsimile? Then it came to me. Of course! The Tim Tam Luscious Strawberry. Arnott’s previous attempt at a Strawberry Tim Tam was not exceptional, it has to be said. So is this latest version any better? Indeed, is it any different? Well, to be honest, it’s hardly different. The filling is a bit less lurid pink. The flavour is dialled down a bit – from eleven to, say, nine. But it’s pretty much the same biscuit as last time. There’s certainly no champagne that I can detect. It still has that slightly artificial aftertaste. It’s still a bit sickly. And it is, as before, better than your average strawberry biscuit – but still not that great. I can’t help feeling that this new range is a bit recycled, what with the Espresso Martini / Three Bean thing. I’m tempted to up my score for the Pina Colada flavour, just as a bonus for originality. I hope the the Velvet Mudslide will be more groundbreaking too. For now, I’m giving these a four out of ten – just like their predecessors. They are quite chompable, but nothing special. Happy Easter, everyone! So how does this blend of iconic Australian biscuitry and Caribbean mixology work? Well, I have to say, not that well. That’s not to say there isn’t quite a lot of pineapple and coconut going on. There’s actually a lot of both. The problem is that there isn’t any rum going on. And without it, a piña colada is just an over-sweetened, rather cloying fruit juice (as apposed to an over-sweetened, rather cloying cocktail). 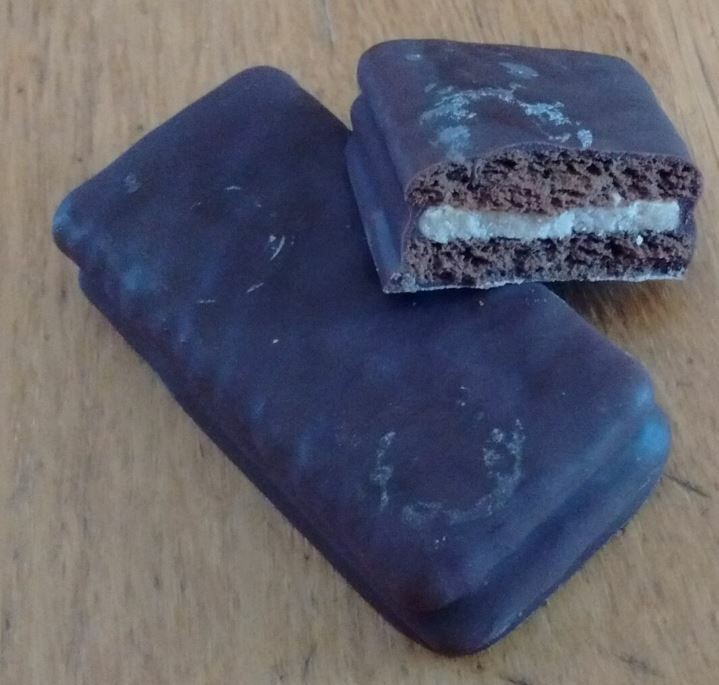 So lots of pineapple (which somehow doesn’t really go with chocolate very well, in my humble opinion) and coconut make for a rather sweet, nothingy Tim Tam. The most interesting thing is the bright yellow hue of the filling. Sorry Arnott’s, this one’s not a keeper. Three out of ten. 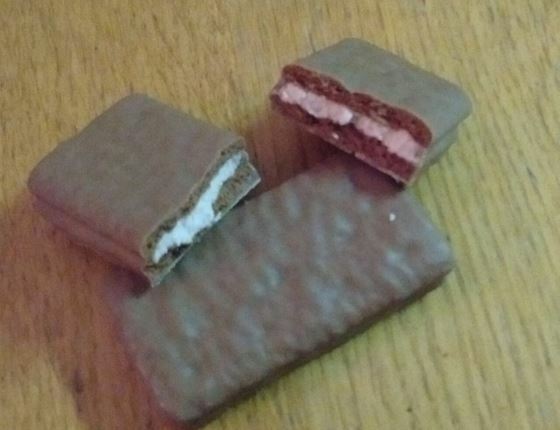 Well, those folks at Arnott’s keep churning out these new Tim Tams. The new strategy seems to be to launch a new flavour every day, have it in the market for perhaps a week or so, and then replace it with something new. It certainly makes for exciting shopping, if rather exhausting blogging. The two new flavours are inspired by cocktails. Arnott’s have got into hot water with this approach before. In 2004 they launched Tia Maria flavoured Tim Tams, which apparently contained a tiny amount of alcohol. This was condemned by the Australian Drug Foundation – ‘won’t somebody think of the children!’, although the controversy I’m sure was great for sales. This time they are playing safe, with a clear ‘virgin’ appended before the name. That said, when I see ‘Virgin’ I think of slightly seedy bearded entrepreneurs, not alcohol-free cocktails. So how are they? When, in many ways they are quite similar to the ‘Three Bean‘ flavour that was available a little while ago (but seems now to be discontinued). They have an attractive coffee flavour, with a slightly grown up taste, which perhaps is the virgin Martini. Stirred but not shaken, perhaps. Not a classic, but not bad at all. If you liked the Three Bean flavour, you will like these about as much. If you hated Three Bean, you’ll hate these about as much. Not much more to say really. I’ll give them a seven out of ten. Next week, we’ll look at the other new cocktail flavour – Pina Colada, so stay tuned. Well, goodness, hasn’t it taken a long time to get around to writing this. For whatever reason, life seems to have been getting in the way of blogging recently, and whilst I carry around with me umpteen ideas for interesting items (using ‘interesting’ in the loosest terms there), I’ve struggled to actually put fingers to keyboard to make them real. If you cast your mind back, you will recall I was asked to give evidence to the Senate inquiry into ‘nanny state laws’, following my submission to the same. The date unfortunately fell during the Chillikebab annual holiday, and initially I said I wasn’t available. However, Mrs Chillikebab, being a rather good sort, told me that I should go even if it meant interrupting our holiday. I guess she was worried that if I didn’t go I’d feel forever bitter and twisted that I missed my opportunity to actually do something vaguely useful in the field of cycling advocacy. So I booked a ticket, and duly left the rest of the Chillikebabs lounging around the pool at our holiday home on the Sunshine Coast and flew to Melbourne for the day. I wasn’t exactly sure what to expect, and when I got to the parliament building and explained I was there to give evidence to the committee they seemed rather nonplussed and didn’t know what to do with me. Luckily I made contact with a fellow free-cyclist, and he kindly showed me to the committee room. I was just in time to hear the evidence from the medico-safely lobby. A whole bunch of worthy doctors, professors and road safety experts all intent on ensuring Australia remains one of the very few places on earth where it is illegal to pedal along a cyclepath with the breeze in your hair. They started predictably enough, with little speeches emphasizing how well helmet laws were working to reduce injury, and how Australia led the world in such safety initiatives, and how many lives were saved every minute of every day due to these wonderful laws. Then the Senators started to question them. There were just two senators – the maverick David Leyonhjelm (the only elected representative of the tiny Liberal Democrat party), and Mattheew Canavan, from the governing LNP alliance, and a member of the smaller National party. I have to say, the Senators were superb. They were across all the material, all the science, understood all the shonky arguments put forward by the medico-safety lobby and grilled them very effectively – pulling apart their arguments and reveling the lack of substance in their submissions. It’s rare the medico-safety lobby are ever held to account, as they avoid public debate, and tend to shut down any attempts at dialogue with high-handed appeals to authority. In this forum, however they couldn’t hide, couldn’t bluster, and couldn’t walk away. They had to admit that the evidence for the effectiveness of MHL was ‘mixed and contradictory’, they had to take endless questions on notice because they were not really across the material, they floundered badly on many very basic points and got extremely rattled and aggressive. It was terrific. I enjoyed every moment of it. Then, after a short break, I was on. I shared my slot with Nic Dow, of the Australian Cyclists Party, a cycling freedom campaigner I have corresponded with online, but never met. Indeed, one of the nice things about going to the inquiry was meeting up with so many people I have either emailed or corresponded with online but never met. We made our opening addresses; I had some illustrations of motoring helmets that have variously been proposed, and I used them both to highlight some of the contradictions in the medico-safety folks comments, and also to show the inquity of forcing helmets only on cyclists. Nic was all over the science, and outlined some of the most recent research that directly contradicted the ‘expert’ evidence from the doctors. Then we had some questions from the committee. I outlined some of my experiences with going to court and so on, and spoke about bicycle hire schemes. Nic spoke more about different types of cycling, noting that a (helmeted) Neurosurgeon out for his high-speed Sunday morning bunch ride was at far higher risk of head injury than an unhelmeted cyclists on an upright bike pootling along a cycleway. A few points I mentioned that they seemed interested in; one was my proposal to decriminalize helmetless riding by making the penalty $0, but maintaining it as an ‘advisory’ law. Thre was quite a bit of discussion about this; both Nic and I made points about the political nature of the debate – however much we might want to, a full repeal of the whole helmet law is unlikely to happen, so we explored various options for staged withdrawals and compromises. Finally I spoke about my framework for assessing helmet laws (and similar nanny state legislation), making further points about the inequity of MHL. It was sort of fun, although I felt I didn’t really express myself the way I would have liked. It’s a bit hard to do when you are being questioned, rather than following your own agenda. But I’m very glad I did it. It was also noteworthy that not one of the ‘pro helmet’ lobby stayed to listen to any of the other evidence. They all trooped in prior to their session, and then all trooped out again immediately afterwards. Symptomatic of their closed minds and unwillingness to engage in any debate, I think. We will see what comes from this inquiry; whilst the final report is not due for a while I think it will be quite critical of MHL. What impact that has, of course, remains to be seem. But perhaps, just perhaps, in ten years or so when MHL are finally banished and we look back at the fight, my small contribution to this small process might just have played some part in that achievement. If you want to read the Hansard transcript (yes, I am now in Hansard! ), it’s here.